Holiday Gift Specials from Yours Truly! Less Than Two Months Until Tarot Release! So, here's this year in review--briefly, because otherwise we'll be here all day. Well, I had two books out, which is great. WICKEDLY POWERFUL was the third Baba Yaga novel, which was then followed by DANGEROUSLY CHARMING the first Rider novel. Got to go visit my friends in Connecticut, got visits from pal Bethany and her charming hubby Jarrod, and my stepdaughter Jenn, and FINALLY met long-time author pal Alex Bledsoe in person at Robercon (where I also got to hang out with the fabulous Tamora Pierce, which is always a joy). Plus, of course, the tarot deck is coming out any minute, so that might end up counting toward this year too. Mind you, there was a lot of not great stuff too. I lost Mystic and Magic's mother Minerva in March (wow, that's a lot of M's). Had to rehome little Luna, because she couldn't adjust to the other cats (although she IS blissfully happy at her new house and I get to visit often). Angus was sick for months with an eye infection, then Mystic got seriously ill and almost died. (They both got better. That definitely counts toward the "good" column.) I seriously hurt my knee on the first of April, and it is still taking it's slow time recovering, and then I got shingles (which are brought on by stress, so I blame the election, plus all that other stuff...). Plus, you know, life. Overall, I'd have to say it was a pretty tough year, where the not-so-great stuff often overwhelmed the great. But I survived and have hopes that next year will be better. And in the meanwhile, I still have a lot to be grateful for, including all of you. So thanks! And now, I'm going to do one last giveaway for the year, just because I can. Maybe it will finish off a few other people's years right. Here's what we've got! A Fire tablet, a set of ALL FOUR BOOKS (signed, of course), winner's choice of one of three book cover notebooks, and a Deborah Blake calendar for 2017 plus a broom pen to write in it with. Four prizes, four winners. Woot! No, Magic the Cat doesn't come with the prizes. Winner gets his or her pick! No, Angus doesn't come with the prize either. But his picture is in the calendar. As always, all you have to do to enter is fill out the Rafflecopter form below. You get credit for anything you've already done, like following the blog, or signing up for my newsletter. And because it is my big end-of-year giveaway, I'm opening it up internationally. There is no purchase required, although of course, if you want to give ME a year's end present and buy one of my books, or put up a review for one you read, I won't tell you not to! Good luck, thanks for everything, and happy holidays, whichever one you happen to celebrate. Only one month left!!! ONE MONTH!!! It’ll be here before we know it. 2017 is looking up! Elisabeth and I can hardly contain ourselves, we’re so excited to see the Everyday Witch Tarot in person. So we’re going to throw another GIVEAWAY! There are only 16 spots left, so order yours today for the special price! After publication on January 8th, the price will go up to $90. See that dragon sketch above? One of our early collectors requested “dragon” for her keyword. Elisabeth had a lot of fun with that one! One thing I love about this Special Edition is that I get to meet Elisabeth Alba in person! We’re going to meet up in January after the deck comes out to sign everything together. I’m really excited! There will definitely be a blog post with photos of the meeting, signing, and merrymaking. This time I'm is giving away either Llewellyn’s Witch’s Coloring book OR the Hip Witch Tarot – your choice of one! 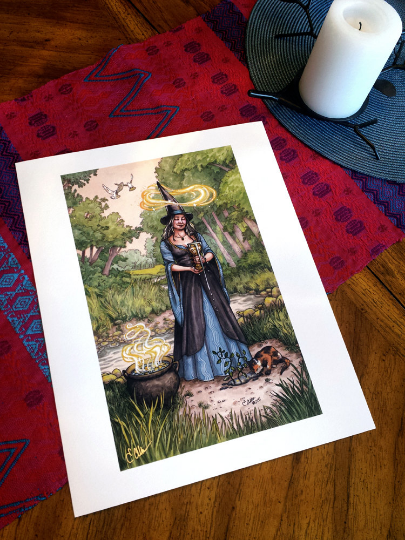 Elisabeth is giving away a signed print of the Ace of Cups. Good luck, and start counting down the days with us until January 8th! 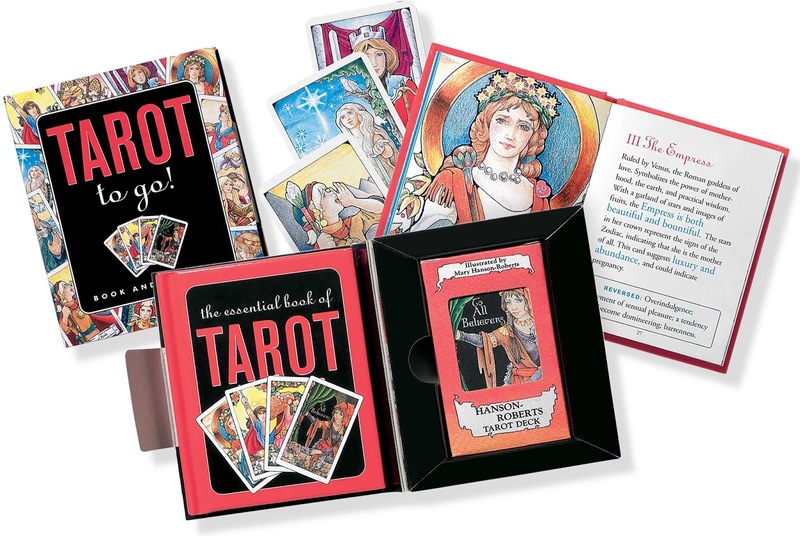 Winner's choice of coloring book or this funky tarot deck! 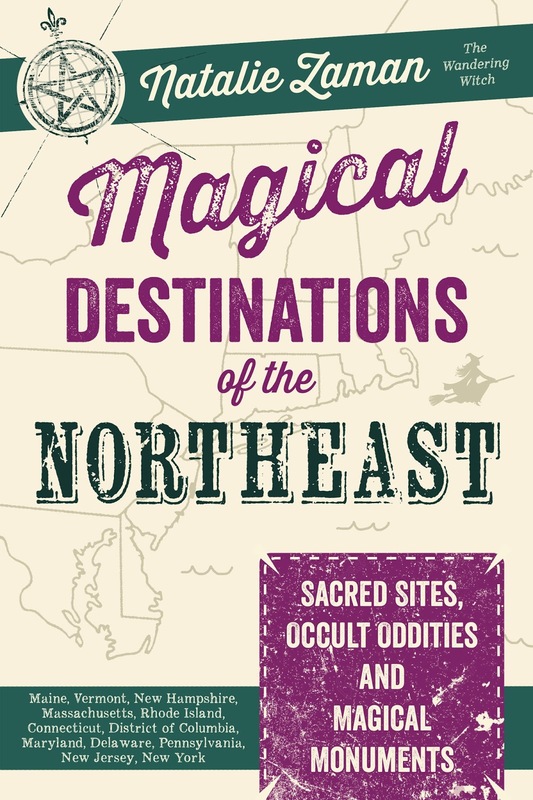 As most of you know, I live in the northeast USA, so you can imagine how happy I was to discover that Llewellyn was putting out a book called MAGICAL DESTINATIONS OF THE NORTHEAST, by Natalie Zaman. They sent me an early copy to look at so I could blurb it, and man, is this book fun! 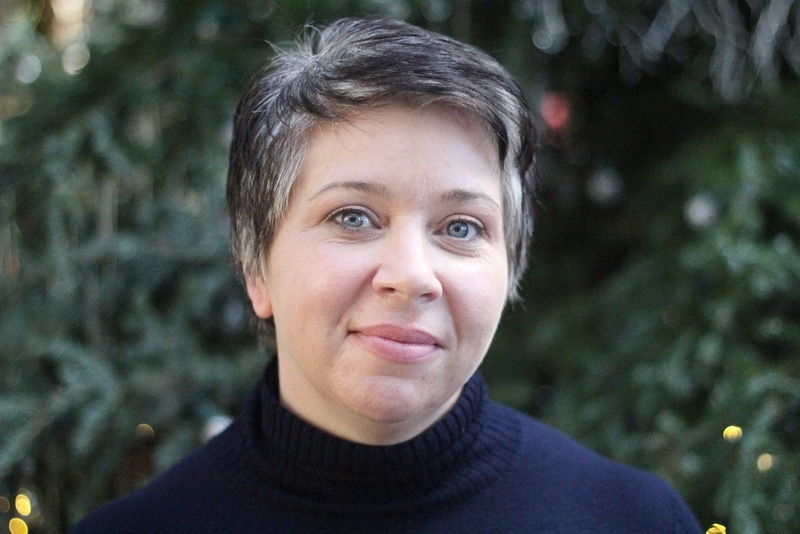 So I asked Natalie to stop by the blog and say hello, and tell us what kind of cool magical places one might find in New York State in particular. Are you as thrilled as me that the new Harry Potter film is set in America? And in New York!!! If you find yourself east of the Hudson River near the Connecticut border (South Salem, NY), you can run with the WOLVES at the New York Wolf Conservation Center. MOOSE—not just in Maine anymore! Visit Adirondack Park for a potential moose sighting. They’ve been in the park since 1980! Narrowsburgh, New York is the EAGLE Capital of the northeast. In addition to the 20 pairs of nesting eagles who are current residents, up to 200 birds winter here from points north in Canada. Visit Narrowsburgh is January and February to see eagles flying overhead. Visit all sort of other BIRDS at Berkshire Bird Paradise—the largest avian sanctuary in the state. New York state is home to several FARM SANCTUARIES, places where animals of all shapes and sizes, some abused and abandoned have found forever homes where visitors are welcome. Check out the Catskills Animal Sanctuary, Farm Sanctuary and Woodstock Farm Animal Sanctuary. ADOPT a pet in/from New York? I did! Check out Time Out NY’s picks to adopt a pet in New York City. The New York Humane Society has been helping animals for over a century, and Rescue Me maintains listings of rescue agencies and shelters by state. Take an OWL or BAT tour in Central Park, the city’s largest green spot. The Cloisters is home to the famed UNICORN tapestries. Rub the snout of the BOAR in Sutton Place Park for good luck! Strike a pose with the Library LIONS at NYPL’s main branch on 53rd Street. BULLS and BEARS—Oh my! Visit these icons of tenacity and strength on Wall Street in the Financial District. Suspend expectations as you gaze at “Gran Elephandret” in Union Square between 14th and 17th Streets, an ELEPHANTINE rendition of The Hanged Man. Visit the Green Wood Cemetery in Brooklyn to see the wildlife (there’s lots), and pay your respects to Henry Bergh, the founder of the ASPCA (there are also several beloved pets buried in the cemetery as well). Find more fantastic beasts near you by visiting Animal Tourism—there are listing by species and state ♥ Visit the Ephemeral New York blog to find more animal sculptures and art scattered throughout New York City. 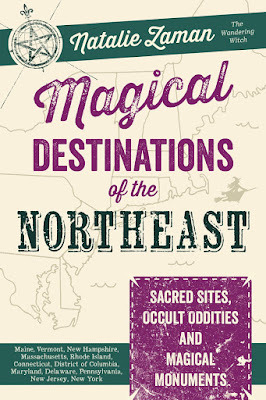 Natalie Zaman is the author of Magical Destinations of the Northeast and co-author of the Graven Images Oracle deck (Galde Press). A regular contributor to various Llewellyn annual publications, she also writes the recurring feature “Wandering Witch” for Witches & Pagans Magazine. When not on the road, she’s busy chasing a flock of free range hens around her magical back-garden. 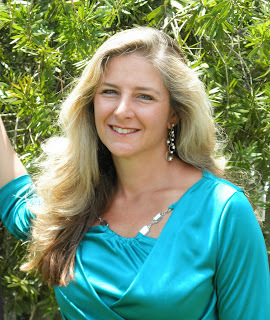 Visit Natalie online at http://nataliezaman.blogspot.com. 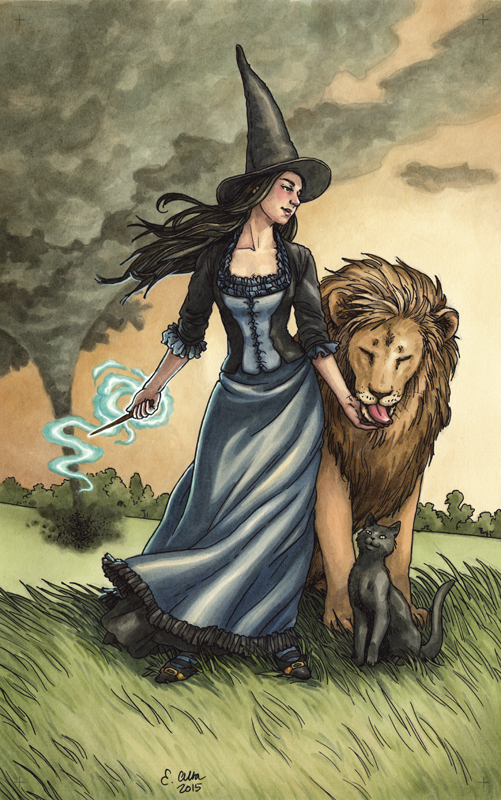 So, I've had a few requests for signed books for people to give as holiday gifts, and of course, Elisabeth Alba and I have been playing around with some ways to allow people to give the EVERYDAY WITCH TAROT as a gift even though it isn't actually out until January 8th...so here's what I've come up with. Feel free to email me, or message me on Facebook with orders, special requests or questions. Some of the additional goodies are in limited supply, so if you're interested in them, let me know right away. (The best email to use for this is magicmysticminerva@yahoo.com or Facebook message me.) Or you could leave me a message here, but if you do, make sure you leave an email for me to use to get back to you. or one of the two remaining limited edition etched keychains (they say Dangerously Charming) with motorcycle dangles. Any of these options would be $42. The free shipping options are for the USA only, alas, although I will happily send any of these anywhere if you don't mind paying whatever the shipping is for International. I'll be taking payments through Paypal, which is easy to use. If you want to give the tarot cards as a gift, I've got 40 gift cards that I'll send out for free (but when they're gone, they're gone) so you can give the recipient something to show them what they'll be getting. Elisabeth also has a downloadable option if you'd rather do that or if you're outside the USA. It has a picture of the Strength card on the cover, along with "A Gift for You," and the inside has a gift note. The back has a holiday greeting and signatures from me and Elisabeth. Plus, of course, I have all the jewelry I've made. I don't know if I'll have time to get anything much up on Etsy (it annoys me), although I do have a shop there https://www.etsy.com/shop/deborahblake -- but you can also check out the pictures I've put up on Facebook, or email/message me if you are looking for something made from a particular stone. So, there you have it; a few holiday gift specials from yours truly. I've never tried doing this before, so I guess we'll find out together if it is something people are really interested in. Let me know if you think of something clever I've forgotten! Happy holidays. Elisabeth and I are totally pumped about the upcoming publication of the Everyday Witch Tarot! What a long process… to finally see the finished product and hold it in our hands will be amazing. We’d like to share two more images from the deck, as well as throw another GIVEAWAY!!! See bottom of post for info about the giveaway. It’s been a tough few months. We thought the Tower and Strength cards from the Major Arcana would be appropriate cards to share during this time. Sometimes things have to crash and burn to make room for something new and better. From the book: A fairy tale tower lies in smoking ruins. To one side is a witch with a mischievous look on her face, a wand hidden behind her back with tiny sparks shooting out of it. A black cat peers cautiously out from underneath some nearby bushes. 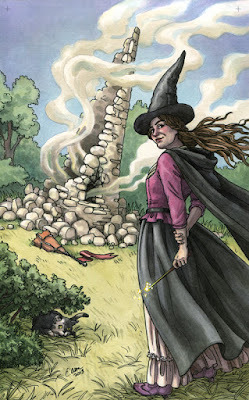 The witch is wearing a black pointed hat and a black cape, and both the cape and her long dark hair are blowing in the wind created by the explosion. The feeling of the card is wild and chaotic, but not depressing. In fact, you suspect that perhaps this witch has purposely blown things up. You just can’t for the life of you figure out why. Life rarely runs smoothly, but there are times when it seems as though our entire existence is crashing down around our ears. Jobs are lost, relationships implode, we lose friendships that we treasured. Some of this is just Life. After all, as everyone knows, Stuff Happens. But much of the time, that chaos and destruction has to occur to make room for something new and better. Take heart. Try to see the positive in even the worst situation. You can survive the blast. Things to consider – Depending on where this card falls in the reading, the explosion may already have happened, you may be in the midst of the chaos, or disaster may still be on its way. If the tower has already gone boom, what can you learn from the experience? What new and positive things can rise out of the ashes of what you have lost? If you are in the midst of the mess, how can you cope better or who can you ask for help? If the crisis is on the horizon, how can you prepare better, now that you know it is coming? Look deep and you may find that you already knew there was something you had to let go of, no matter how difficult the process might be. What can you build out of whatever remains? There is a lot of power in the Strength card, but it isn’t because the witch has more magic than anyone else, or can turn you into a toad without a second thought. (Although both of those may be true.) Her power comes from confidence in her own abilities, and knowing that the universe makes all things come right in the end. Even her cat has that kind of confidence, and views the huge lion as just a slightly larger member of the family. The Strength card reminds us that we have what it takes to triumph, no matter what comes our way. Things to consider: If this card appears in a reading, it is almost certainly there to remind you of your own inner strength. It is saying, “Yes, yes you can.” You may feel overwhelmed or uncertain, but whatever you are facing, you have the strength to endure, and in the end, triumph. And now, finally, THE GIVEAWAY!!! We’ve got two items for two lucky winners! Deborah is giving away the mini Tarot to Go! 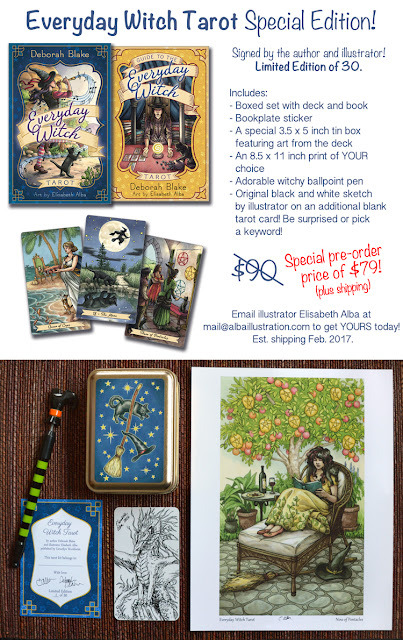 set, and Elisabeth is offering a lined hardback notebook featuring the art for the 9 of Pentacles on the front! Good luck! I'd like to welcome my friend Lucienne Diver to the blog. I fell in love with Lucienne's writing through her lighthearted paranormal romances, but she has a book out today that is a complete change of pace--and it looks truly amazing. So I invited her here to talk about what it took to do such a major shift of her writing gears, and ask her why she felt the need to write this book in particular. I hope you'll give her a warm, Writing the Witchy Way welcome. And then—well, as I write, it occurs to me that there wasn't really an and then. Not for a long while. The two series I've written, Vamped and the Latter-Day Olympians, have featured snarky heroines who are tough enough to take on anything life throws at them. They're special. They have powers, not the least of which is thinking of that perfect one-liner I'd only ever come up with after the moment had passed. I love these girls. I want to be them when I grow up. Well, maybe not Gina so much, since I do like my tanning options, but certainly Tori from the Latter-Day Olympians series with two hunky guys falling all over themselves for her and the ability to quite literally stop men in their tracks. 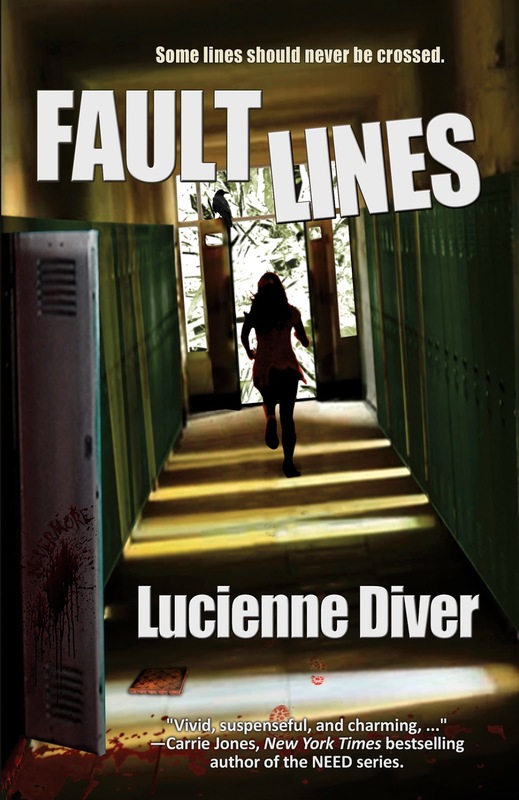 But with Faultlines, I'm writing about things I wouldn't wish on anyone, yet teens deal with them on a daily basis. Sure, I put my issues into a suspense plot, but that only ups the tension and stakes rather than lessens them. I couldn't wisecrack my way through this book. My tone had to change. This was difficult for me at first. As my critique partner could tell you, my first few beginnings were too light in tone. Too flippant or distant for what was going on. My character, Vanessa, needed to be wrecked. Really and truly. Her best friend Lisa had just committed suicide, and she didn't know why. Lisa had pushed her away, pushed everyone away, a few months prior to her death. Vanessa blames herself for letting it happen, for not fighting harder for the friendship and for not seeing the signs. She's dealing with horrible guilt on top of her loss and gets herself through things by finding a purpose, the search for answers about why Lisa did what she did. Unfortunately, that search brings danger to her door. This was the hardest thing I've ever written. To tap into Vanessa's emotions, I had to tap into my own. Books don't develop in a void. They're spawned from our own experiences, and this book came from a deep, dark place within me. I was afraid to access that place, afraid that rather than me illuminating the void, the darkness would reach out to snuff my light. I needed a very strong and powerful light as a talisman against that dark, both for Vanessa and for myself. That talisman came in the form of her little sister Ari, who she dubs the "tiny terror". Ari is alternately irrepressible, troublesome and sweet. She's a force of nature, and she will not be denied. With all the sorrow in the world—the terrible stories of bullying and harassment, suicide and other violence turned inward or outward—it's vital that we all find our light, that thing that banishes our darkness, whether it's people who love us, furbabies (or scaled or feathered babies) who count on us or art that refills our well. When you find your light, shout down any voice, internal or external, that tells you that it's frivolous or a unacceptable or anything else. Especially, don't bully yourself. It's self-care, and it's crucial. 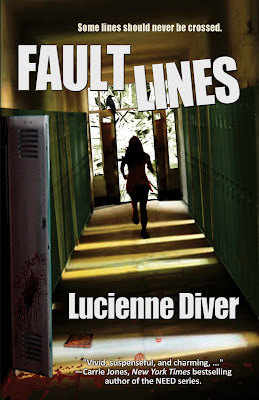 I love my strong, snarky heroines, but I want to speak for others as well, just as in Faultlines, where Vanessa needs to speak for Lisa when she can no longer speak for herself. In case you're interested in learning more about the book or (yes!) getting a copy for yourself, here are a couple of recommendations, the book blurb, and a couple of links. If you have any questions for Lucienne, go ahead and ask them! She's going to be GIVING AWAY A SIGNED COPY to one lucky commenter!